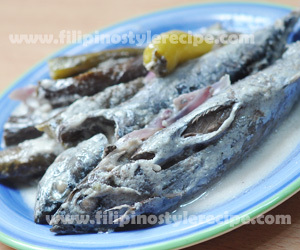 Filipino Style Recipe: sinaing na tulingan is a simple fish dish by Filipinos but it requires a lot of time in cooking. Normally the fish slit horizontally on both sides then flatten. Season with salt and then wrap using banana leaves. Traditionally, we used clay pot and cooked the fish in a hot charcoal for at least 2 hours or more until it is almost soft including the bones. 1. Clean the fish by removing the gills and innards then chop off the tail. 2. Slit a long horizontal line on both sides then press to flatten and soften the fish. 3. Wash on running water then rub with salt. 4. Wrap the fish with pre-cut banana leaf then set aside. 5. 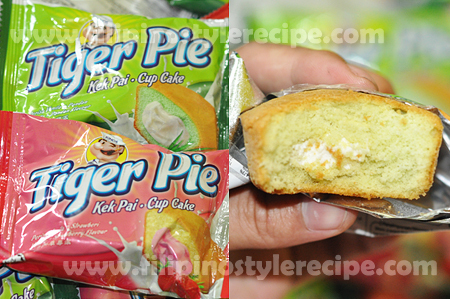 Repeat the procedures for remaining pieces. 1. In a clay pot or cooking pot, arrange bilimbi then put the fish side by side. 2. Add green chili then pour water until the fish is almost covered. 3. Cover and simmer in a low heat for at least 2 hours. Add more water if necessary. 4. 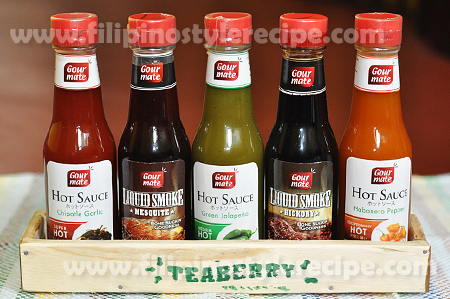 Continue cooking until the liquid is almost dries up. 5. Remove from heat then served with steamed rice. 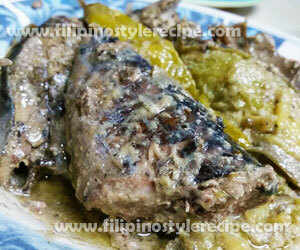 Filipino Style Recipe: ginataang tulingan or mackerel in coconut milk is another simple and easy Filipino dish. 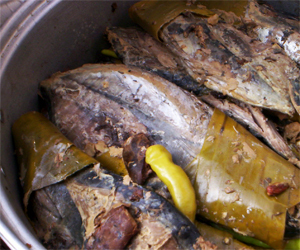 It is usually consist of mackerel(tulingan) cooked in a combination of coconut milk, vinegar and some spices. 1. In a saucepan, arrange tulingan and eggplants. 2. Add the green chili, garlic, onion, tomatoes and ginger. 3. Pour in the vinegar and season with salt and pepper. 4. Let it boil for a few minutes and add the coconut milk. 5. Let it simmer 10 minutes or until tender and the sauce is creamy and oily. 6. Add red chili then adjust seasoning according to taste. Simmer for another minute.